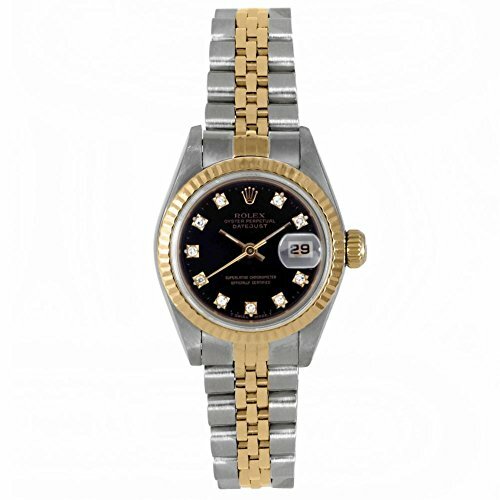 Rolex Datejust swiss-automatic womens Watch 69173 (Certified Pre-owned) | What Should I Say? Rolex Ladies 26mm Stainless Steel & Yellow Gold Datejust - Automatic Movement - Quickset Date Feature - Sapphire Crystal - Black Dial with Diamond Hour Markers and Minute Hash Marks - Yellow Gold Fluted Bezel - Stainless Steel & Yellow Gold Jubilee Band. This Beautiful Watch Comes Fully Serviced and Polished with a 1 Year Warranty & Generic Wooden Watch Box Included from Seller. Comes to fit 6.5 Inch Wrist but Can Accommodate Larger or Smaller Upon Request. Buy with confidence knowing each timepiece goes through the same rigorous 31-point inspection. Rest assured only authentic parts straight from the manufacturer are used. The Certified Pre-Owned Program on Amazon ensures peace of mind and transparency via standardized reports and a 1 Year Warranty Provided by WatchFacts.